As millions of Orthodox Christians around the world prepare themselves for the glorious feast of Ascension of our Lord, hundreds of Orthodox Christians from across Syracuse (Upstate New York) Metropolitan area flocked to the Holy Evangelist Luke Ukrainian Orthodox Church parish in Warners, NY on Monday, 6 May, 2018 to see what they believe to be a different miracle. Assisted by over 20 priests from various Orthodox parishes in the area His Eminence Archbishop Daniel, welcomed the arrival of Kardiotisa, “The Tender Heart” myrrh-flowing, miraculous icon of the Virgin Mary into the midst of about two hundred people, who flocked to St. Luke’s parish throughout the evening. Fr. Mark Leisure, the pastor of St. George Orthodox Church in Taylor, PA delivered the icon into the hands of Vladyka Daniel and Very Rev. Fr. Mykola Andrushkiv (pastor of St. Luke’s parish). In his sermon, Archbishop Daniel reflected upon the call to holiness, while encouraging people not only to observe the miracle of the icon but by partaking and learning from the miracle, and enabling each other to be the examples of holiness. 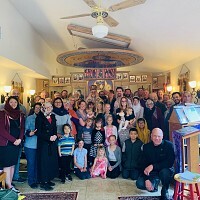 Moreoved, Vladyka Daniel welcomed the visiting clergy from the local Antiochian Orthodox Christian parishes as well as from the Bulgarian Orthodox Church, who concelebrated the Moleben service to the Birth-Giver of God. A special guest at the service was Bishop Borys Gudziak of the Ukrainian Catholic Church of France, Belgium and Netherlands, who accompanied by the local Ukrainian Catholic clergy and faithful joined the Orthodox brethren in prayer. Before the faithful had a chance to venerate the icon, Fr. 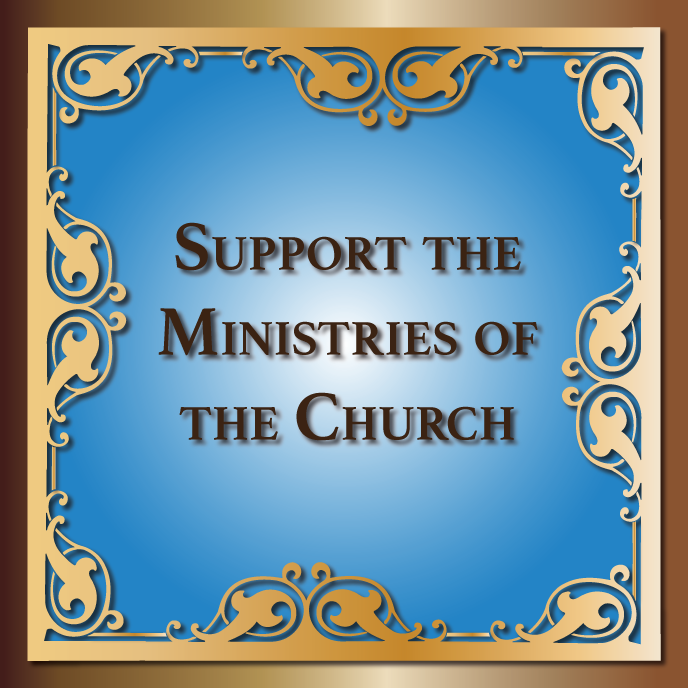 Mark shared a few powerful accounts of the miraculous wonderworking icon. Over the past several years, these miracles have happened again and again – with people finding healing from prostrate cancer, liver cancer, throat cancer, lung cancer, brain lymphoma, and almost every other form of cancer. There is even one oncologist who now, along with his medical treatment, directs his patients to visit the St. George Orthodox Church in Taylor, PA and be anointed by this miraculous myrrh. One man had a ruptured brain aneurism. While in the hospital’s ICU, he was in a coma with no hope for recovery. The doctors told the wife and family to say their goodbyes. A friend of the family knew a priest who had seen the Kardiotisa icon and had a cotton swab with the myrrh. He came and anointed the man, and the man awoke from the coma, healed. The doctors couldn’t explain what happened, and said it was truly a miracle. A woman couldn’t see through her pregnancies. Four times she became pregnant, only to have her baby miscarried at a particular point in the pregnancy. There was a problem where the stem that connected the spinal cord and the brain, and this caused the miscarriage. During her fifth pregnancy, before she went to the doctor for an ultrasound, she was anointed with holy myrrh from the icon. In the ultrasound picture, which we all saw, there was an obvious light that had connected the brain with the spinal cord. The doctor and nurses said they had never seen anything like this before. The woman gave birth to a healthy child. A young boy is rushed to the hospital with a 105 temperature. There is swelling of the brain and nothing seemed to be working to lower his temperature. His grandmother remembered that she had an old cotton swab from the miraculous icon in her purse. When she pulled it out, it was dry. And yet, she took it and tried to anoint her grandson, asking for the Virgin Mary’s intercession. Shortly thereafter, the boy’s temperature broke and he sat up. The next day, she took out the cotton swab again, and discovered that it was now soaked with myrrh and had even formed itself into a heart. These are only a few of the wonders and miracles that were shared with those in attendance by Fr. Mark. In conclusion of the service, Fr. Mykola Andrushkiv offered words of gratitude to the custodian of the icon and welcomed hundreds of Orthodox and Catholic Christians that came to venerate the sacred image of the Theotokos. Seminarians of St. Sophia Ukrainian Orthodox Seminary (South bound Brook, NJ) that arrived with Archbishop Daniel, prayerfully chanted responses to the Moleben service and for several hours sang pious Western Ukrainian sacred hymns to the Birth-Giver of God. As the icon departed for Taylor, PA, the parish’s Sisterhood treated everyone in attendance to a light snack. In conclusion of the spiritual journey of the day, Mr. Hryhoriy Lisnychyj, speaking on behalf of the parish board of administration and the entire St. Luke Ukrainian Orthodox Church in Warners, NY greeted His Eminence Archbishop Daniel with the 10thAnniversary of Archpastoral service in the life of the UOC of the USA. Vladyka was gifted numerous treats and memorabilia from Syracuse Metropolitan area. The miracle of the Kardiotisa icon is just one small example of the unfathomable mysteries of life and of the Creator of Life, God Himself! Sometimes we can only observe in awe and wonder, and give glory to God for the way He reveals His majesty! People of all ages, abilities, and backgrounds were drawn to the Icon, some returning to the Icon again and again. It was truly a spiritual experience to remember.